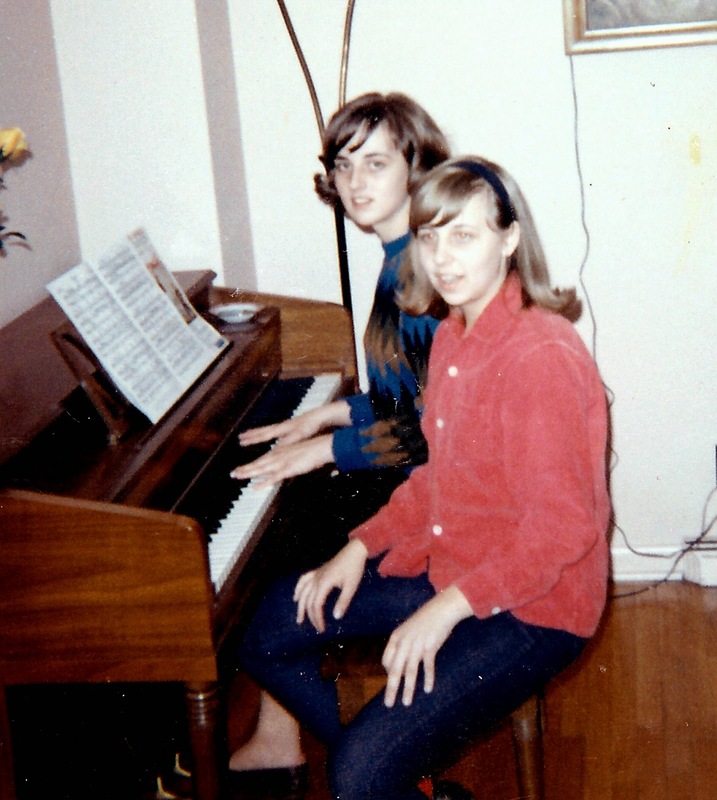 My sister, Linda, and I did not fight much like a lot of siblings. Two and a half years my senior, Linda welcomed me with open arms when I arrived one cold day in February, 1951. Of course, I don't remember any of this...but stories told make me think Linda thought of me as hers, kind of like a live baby doll. Of course, we had the typical tiffs. Usually I was the one who instigated any discord...but never to big fights with pinching, shoving, or punching. I can not remember a physical fight. Our verbal 'fights' would rate at a number one on a scale of 1-10. Those were the usual 'turf war' arguments when we were on a long road trip. This was before seatbelts and car seats. Linda would be in the back seat behind my father (the driver...heaven forbid Maxine drove), and I behind my mother. Anyone who has travelled in the back seat with a sibling knows that there is that imaginary line that divides the space. Do not cross that line...respect the other's space. Being the younger sister, it was my duty to be the first to cross the line. It was just too tempting. On long trips Linda would try to fall asleep. I think reading made her car sick, so she would close her eyes and try to sleep. I'd spend my time looking out the window or reading...but that line would be nagging me...calling me to put my toe right at the edge. I'd stretch, look at Linda, and slowly nudge her foot. Sometimes it would take a number of nudges before she would open her eyes and tell me to stop. Stop? Stop what? I feigned innocence. And then my fingers would somehow want to walk to the line and kick their legs like the Rockets. One, two, kick...one, two, kick. Linda would tell me to stop. This would continue, with me finding a variety of ways to trespass on the edge of her property. "Make her stop!" she would finally say. 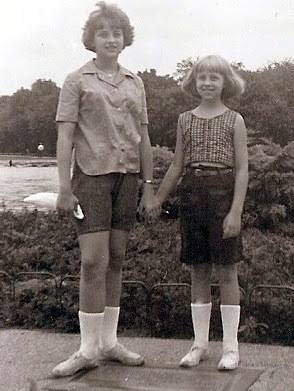 And my father would say something like, "Now girls, let's get along." Sometimes that was enough....but on a long road trip (our grandparents lived seven hours away) the temptation would be too much and I would be at it again. "Girls, stop. Get to your corners," my father would say. Mother would turn around to try to see who the culprit was...but I was slick and she would see me looking out the window with great interest. After some time my toe would want to visit Linda again. The routine would repeat...sometimes the fingers would walk along the back window and slide down the seat 'accidently' touching Linda's shoulder. "Girls, stop. Do I have to pull over and stop the car?" My father's voice sounded serious. 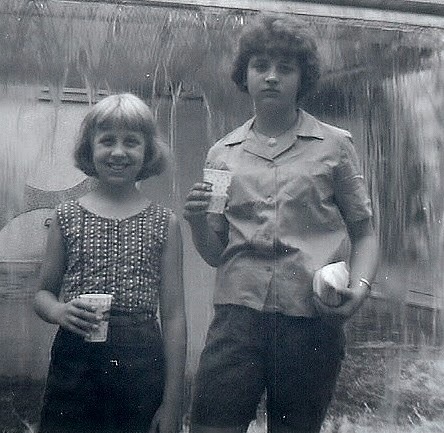 This was on one of our vacations...I think we were at the St. Louis Zoo. Not to say that Linda never teased me. The one thing she could do that would make me upset was to sing the "February Song" that she created. She was born in October which has 31 days. I was born in February with 28(9) days. She would sing these words to the tune of "Oh Dear, What Can the Matter Be." It only has 28 days. Sometimes she would just hum the tune. Then it would be my turn to say, "Make her stop!" is hanging open...let's say I was singing. I love reading about normal siblings because my brother Jeff and I are lucky to still be alive, to have survived our childhoods. 21/2 years difference for us too and I arrived first in 1949 so our times were close to yours. Hmmm we were so physical and verbal. What about now? We're good. No more fights! You were quite the tease. Poor Linda! The oldest child always is the one most tortured by the younger siblings. Believe me I know, I'm the oldest of five. I loved reading this! I have two older brothers and I usually sat in the middle seat. I remember that "line" and I think we still fight over it when we're in cars together! Thanks for sharing about your sister. We had some amazing battle, but are close now. This is the sweetest post! I love all the pictures and love in this slice. I am definitely grateful for my brother. We never *really* fought, mostly just pestering each other! I'm an only child, but your story reminds me of my daughters. My youngest is Katie, and she sounds a lot like you! They didn't fight much either, but if there was an instigator, it was definitely Katie! ;-) I love your photos!